International Women's Day was March 8th and this is Women's History Month so today's Feel Good Friday is all about the ladies! Salt is a new magazine that is also "a platform for Positive Change Agents". As they explain on their website, "Our goal is to make the world a better place by promoting compassionate business practices." When you buy a magazine, they plant a tree! 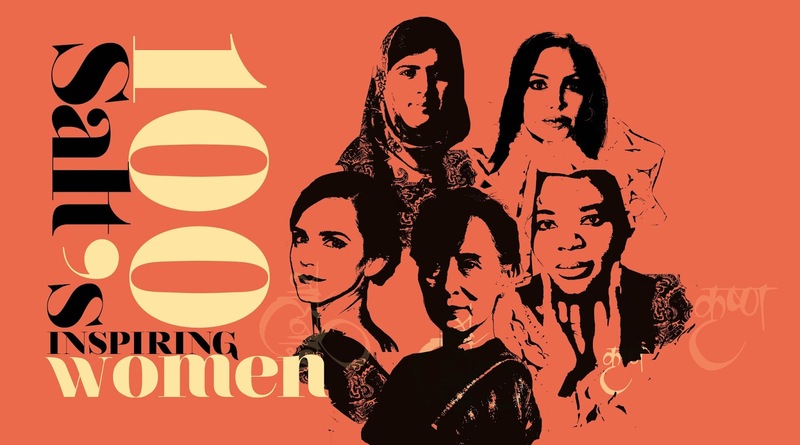 To celebrate International Women's Day they published a list of "100 Inspiring Women". The list includes a variety of women from around the world including authors, actors and activists. When you take a look through the list, you'll see names you likely know. Politicians such as Senator and presidential candidate, Hillary Clinton (#82); Angela Merkel (#3), the first female German Chancellor and Mary Robinson (#6) the first female President of Ireland. Actorvists (can I make that a word?) such as Amy Poehler (#89), comedian and founder of http://amysmartgirls.com; Angelina Jolie (#55) a UN Goodwill Ambassador who campaigns against sexual violence; and Emma Watson (#13) representative of the UN gender equality campaign He For She. As you continue to search through the list you'll find it's full of Nobel Peace Prize winners! Rigoberta Menchú Tum (#38), Guatemalan activist who brought attention to the plight of indigenous people during that country's civil war; Malala Yousafzai (#11) Pakistani activist who campaigns for girls education after surviving being shot by the Taliban; and the woman in the number one spot this year, Burmese democracy activist, Aung San Suu Kyi (#1). It's fun to read about people you know and be reminded of why they are influential, inspirational and all around awesome (yeah, I'm talking to you Jane Goodall). Even more fun is to click on the names you don't recognize. How else would you learn about Chinese LGBT activist Li Tingting (#9), Scottish lawyer and environmental activist Polly Higgins (#35), Liberian peace and women's rights advocate (and Nobel Peace Prize winner!) Leymah Gbowee (#2), Estela Barnes de Carlotto (#99), the 85 year old leader of the Grandmothers of the Plaza de Mayo who search for children taken away by the military dictatorship during the Argentinian Dirty War, Senegalese rapper Sister Fa (#51) or Niloofar Rahmani (#77), the first female Air Force aviator in Afghanistan? If you want to read about more women than I've highlighted here but don't have time to go through all 100 profiles, you can check out this curated list of 23 women provided by Daily Good. To bring more positive news like this to your feed, like Salt's Facebook page and follow them on Twitter @SALT_now. Who run the world? Girls!